Royal Enfield part No. 113066 is the key to the left-shift four-speed linkage. "I've got more slop than a pig feeder and searching for a solution quickly brought me back to your trusty and reliable blog. I'm going to go with the '113066' solution until I can switch to right shifting," wrote Chris Bartlett of North Carolina. Four-speed Royal Enfields Bullets imported to the United States from India had a problem: they shifted on the right, traditional for British motorcycles. The U.S. required that they be made to shift on the left. The resulting left-shift mechanism, commonly referred to as "The Bodge," met government standards, but no one else's. "Have you ever seen a left-side shift?" Martin Scott asked me when I interviewed him in 2009. Scott was the first U.S. distributor for the made-in-India Bullets. "Well, when we got them they wouldn't shift at all," he said. "We had to tear into them before they went to the dealers or they'd have freaked out." I've written repeatedly about The Bodge on my 1999 Bullet. 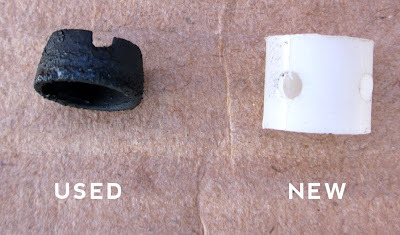 I've called the little plastic bushings of the left-shift mechanism "the worst part of the Royal Enfield." 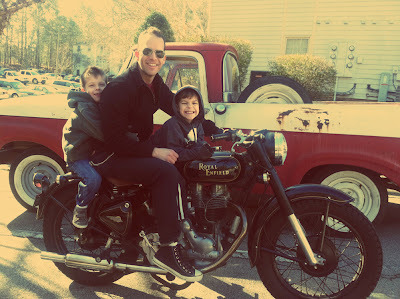 Chris Bartlett is a man of many talents, among them producing T-shirts inspired by vintage motorcycles and motorcyclists. He sells them at Her Majestys Thunder. Chris also has given his own four-speed Bullet a wicked vintage look. He recently realized it was time to replace the bushings. "I got the bushings and swapped out the part in about 10 minutes. It provided a nice little how-to session for my -7-year-old son before we went out for a ride together. "I had been having a really sloppy time with my shifting and now it's like a new bike! I have no desire to move to right shifting at all. The Bartlett boys pose for a picture. From left, Hudson, 5, Chris and Porter, 7. Chris, what is the trick to replacing the top bushing???? Answering for Chris, the trick is to have a double jointed right wrist. Sorry; bad joke. Actually, what helps me a lot is to remove the rear wheel. This gives me the access I need to get to The Bodge linkage without removing the primary covers. I hope this helps.